This week saw the Pound capitalise on considerable uncertainty with Pound Sterling Euro breaking the 1.15 mark and Pound-Dollar floating above 1.42 at interbank. Although Sterling enjoyed the most notable increases against the previously mentioned pairs Sterling overall has performed well against a basket of major currencies. Its acceleration in recent weeks was assisted by the signed transitional deal with the EU signalling more stability for UK businesses and the wider economy and arguably providing a lot more transparency on Brexit. Average earnings data continues to show promise rising by 2.8% in April, although offset perhaps by gradually slowing UK inflation rate, the data was accompanied by an improved unemployment rate of 4.3% falling to the lowest level since 1975. Retail sales also impressed this month growing at a rate of 0.8% which equated to a like for like the annual rise of 1.4%. However, the real spur was the interpretation of this data, which was processed positive by the Bank of England who as markets expected voted in favour of keeping UK interest rates at 0.5%. Although where in recent months the monetary policy committee had voted unanimously in favour of unchanged rates, two of the members voted for a rate rise. The Pound Sterling – Euro rate rise was attributed to by a collection of positive UK economic data outcomes which has gradually boosted the Pound the Euro has struggled recently. One of the largest swings in the currency pair was fueled on Thursday when the ECB delivered a very dovish march statement which was compounded by following industrial data, in turn, investors switched away from the single currency to others. Amongst the European Central Banks concerns were the effects of potential tariffs which could be imposed by president Trump. Other unforeseen issues included the UK’s departure from the EU and the financial hole that could create when eventually resolved- despite the widely reported divorce payment which the UK will provide upon departure. In a marginally more buoyant tone, the ECB confirmed they remained on target in terms of tapering and dispelled any ideas that asset purchases would be increased. Previously the ECB had little concern for the continually strengthening Euro, it appears their position has changed, almost certainly exasperated by the prospect of levies on goods imported into the US. Inflation also remains a real issue in the Eurozone demonstrating little or no uptrend. However, 5 weeks on from the March ECB meeting minutes many of this month’s Eurozone economic data readings a have missed the target and potentially highlight a worrying trend for the ECB. A particularly large uptrend in GBP/EUR was witnessed on the release of the latest monthly industrial production, estimated to demonstrate a 0.1% rise Industrial production fell by 0.8% although on an annual basis Industrial Production rose by 2.9 %. 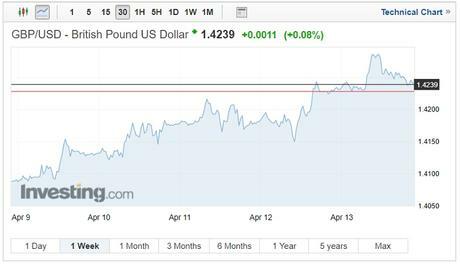 Traditionally the Pound sterling performs well in April with the currency ending higher over the last 14 years. Also, overseas earnings are typically repatriated back to GBP in order for year-end tax returns to be filed. The Pound has triumphed in recent weeks gaining against a continually depreciating dollar and arguably overbought Euro. Currently, the Pound – Euro pair sits at 1.1547 having rocketed to 1.1586 on Friday. Notable movements were seen following the ECB minutes and Eurozone industrial production figure when the pair moved from 1.1471 to 1.1529 in a few hours. The Pound has enjoyed more gradual gains against the Dollar closing at 1.4239 on Friday and primed to make further gains as the US market direction becomes opaquer. 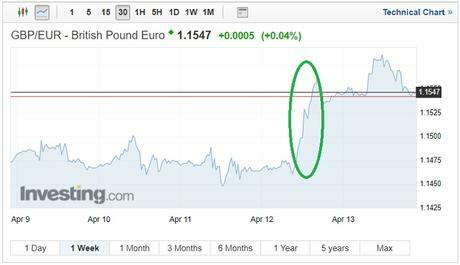 Can more Pound Sterling – Euro strength be expected? Sterling posses all the attributes to climb further over the coming months. This week sees jobs data releases for the UK with the first piece of economic data being the claimant change which is expected to go up by 13.3k. The unemployment rate is expected to remain unchanged at 4.3%. Any decrease in this data will be great for sterling and really give the Bank of England something to think about. Jobs data is followed by year-on-year CPI and is forecast to remain at 2.7% the key will be showing markets stability. Thursday marks the release of the UK retail sales which are expected to contract by 0.5% following last months 0.8% continual growth will provide confidence in consumer spending. A good run of key UK economic data will provide the MPC with more to deliberate in May, currently the probability of a May UK interest rate rise is around a 50% a good run of data will surely make the argument more compelling.